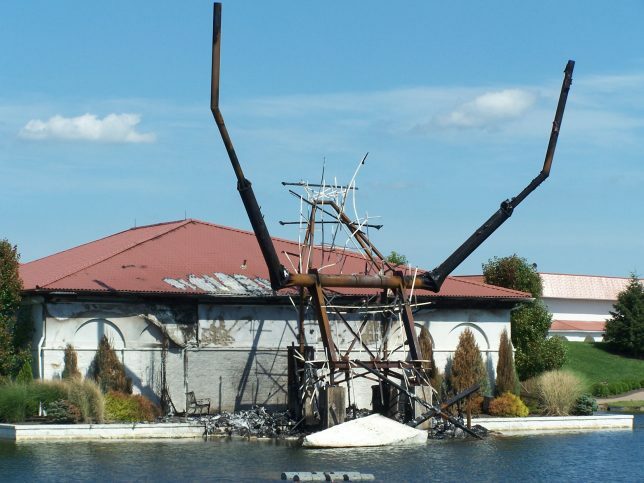 Gone up in flames and burned down to the ground – these 10 well-known statues, monuments and large-scale advertisements all fell to fire, if not fury. “I like big fat men like you,” stated Eli Wallach’s character “Tuco” character in the 1966 film The Good, the Bad and the Ugly, “when they fall they make more noise. And sometimes they never get up.” The bandit’s brash insult was prophetic in a way: big statues and monuments (fat or not) often meet their demise rather spectacularly. Unlike the film’s doomed Union Army sergeant, however, these fallen statues fell in the most dramatic way possible – covered in flames. Take “Big Tex”, a 52-ft tall statue and marketing icon who, for 60 mainly uneventful years, proudly stood at the State Fair of Texas in Dallas. 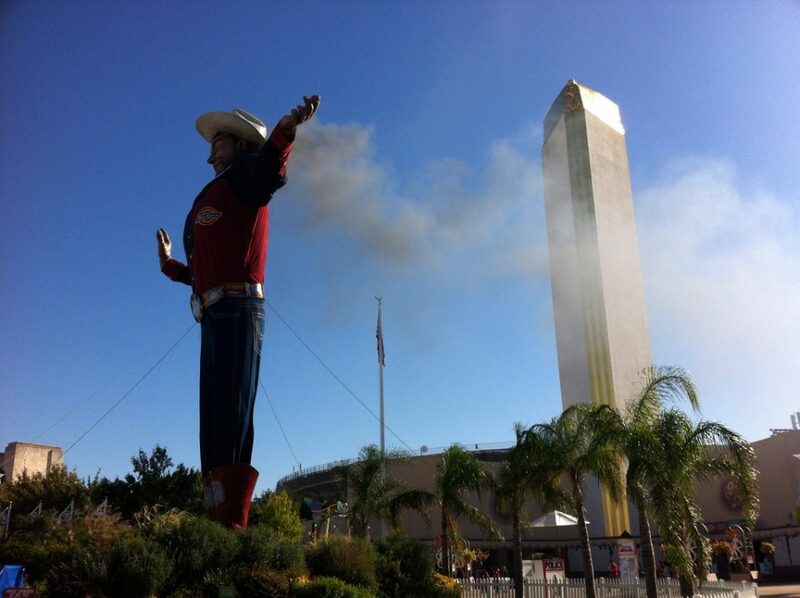 Big Tex underwent a series of renovations and improvements over the years, including the installation of an interior electric fan to puff out his western shirt. 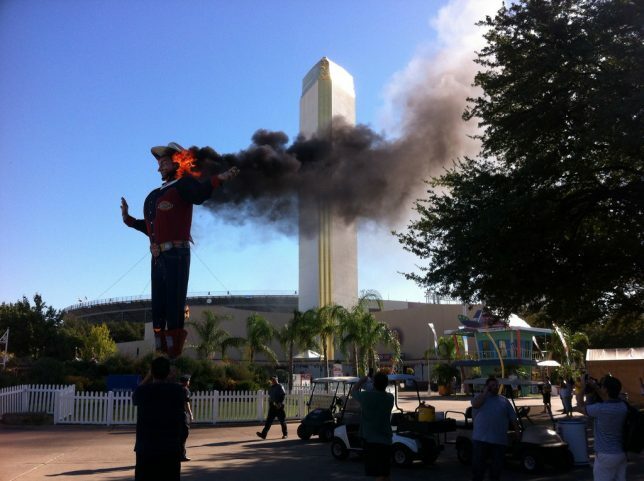 On the 2012 State Fair of Texas’ final weekend, a short-circuit in the fan’s electrical panel mounted inside Big Tex’s boot sparked a blaze that consumed the iconic statue in minutes flat. 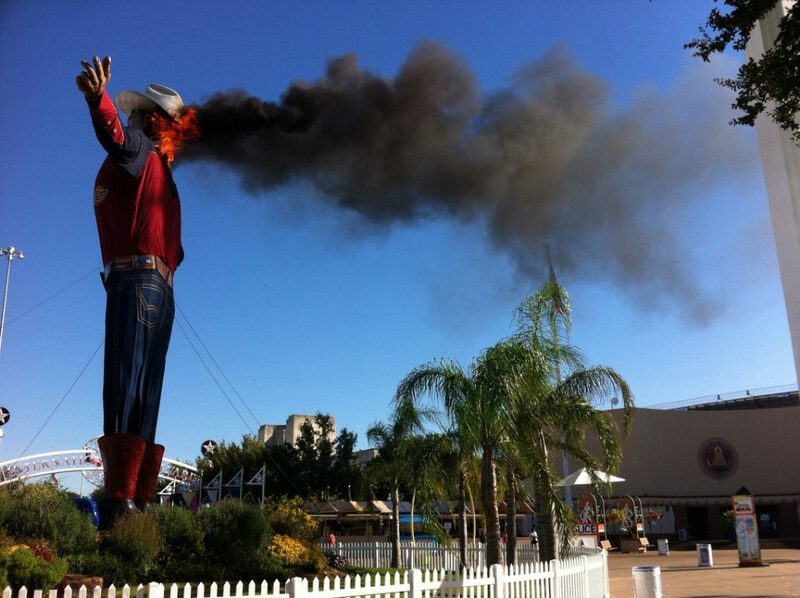 Flickr member greychr was at the State Fair on October 19th, 2012 when the original Big Tex enjoyed a last “smoke”. 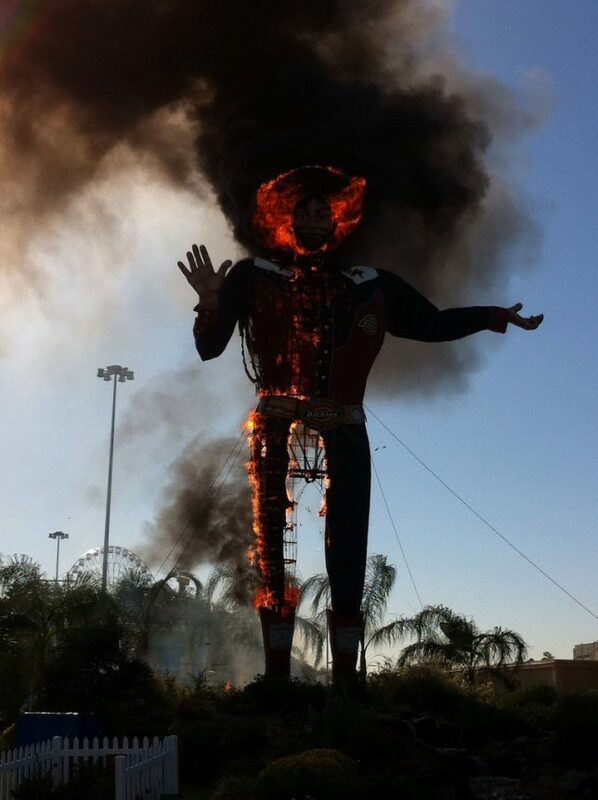 By the way, Big Tex would rise again – a slightly larger (and presumably more fireproof) version was erected in time for the 2013 State Fair of Texas. Puffy shirt provided by Jerry Seinfeld. Frazee, Minnesota is proud of its turkey farms and associated businesses, and the feeling is mutual. 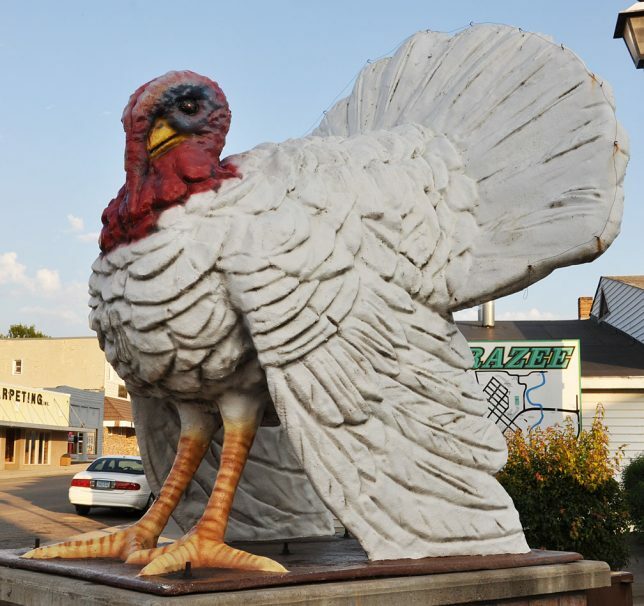 As such, a committee representing these stakeholders collected $20,000 in seed money and in 1986 the World’s Largest Turkey, dubbed “Big Tom“, took its place in the town square. The 22-foot-tall statue rapidly wore out its welcome in Frazee, however, as it was easily damaged and repairs were costly. 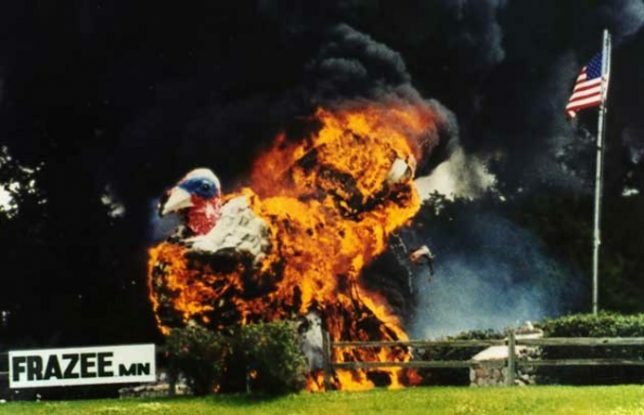 In 1998 a replacement turkey statue was commissioned. The original Big Tom wasn’t about to leave without a fight, though. As workers wielded a cutting torch to remove the statue’s wings, the body caught fire and the hungry flames quickly gobbled up the monument. Pity it wasn’t a statue of a giant green bean casserole, but we digress. 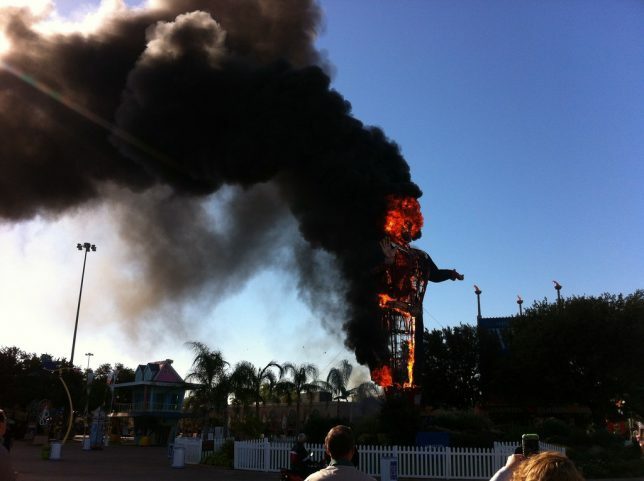 Big Tom’s 20-foot-tall fiberglass replacement has thus far resisted the urge for immolation. 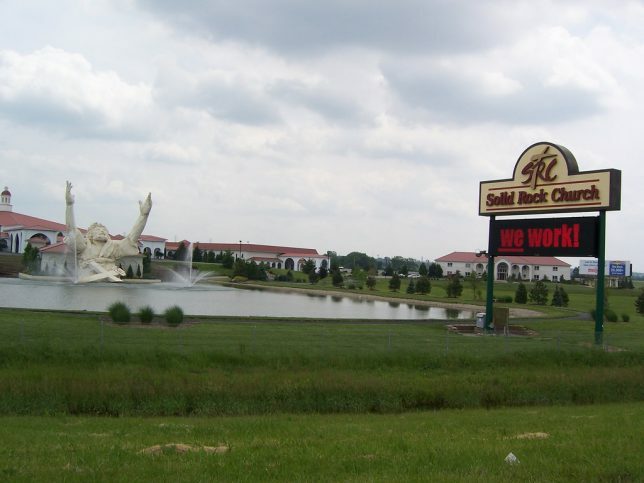 The Solid Rock Church in Monroe, Ohio, is a so-called megachurch with over 4,000 members, thus raising roughly $250,000 to commission the 62-ft-tall “King Of Kings” statue in 2004 was no big deal. The resulting statue (dubbed “Touchdown Jesus” by detractors) featured a steel armature covered in styrofoam and finished off with a thin fiberglass “skin”. All was well until a severe thunderstorm struck the Monroe area on June 14th of 2010. 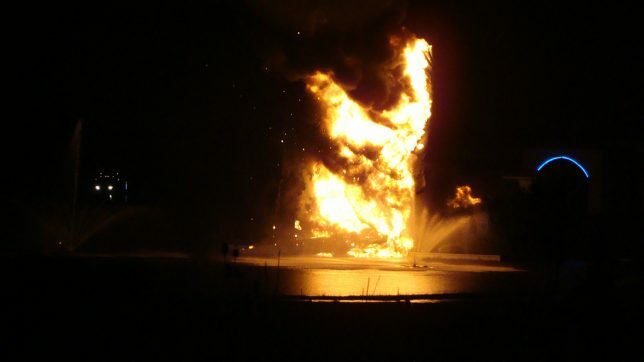 During the storm, a bolt of lightning struck the statue, set the flammable styrofoam alight, and left only the spindly steel “skeleton” intact. 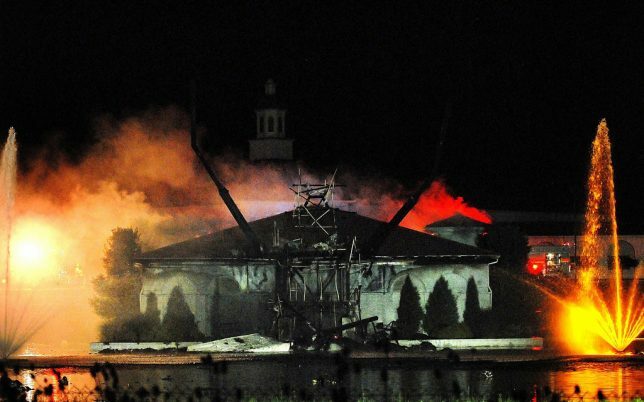 Naturally, those same detractors dubbed the remains “Terminator Jesus“. 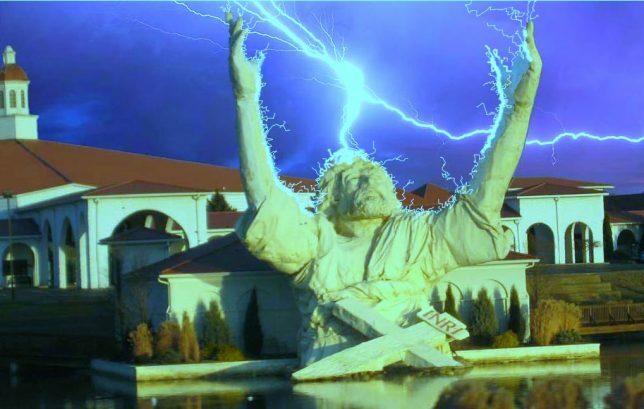 Mourn not, ye faithful… the Solid Rock Church’s Jesus statue was resurrected as “Lux Mundi”, sans the “touchdown” arms, and was dedicated in September of 2012.